Green screen is a hybrid, Leionema elatius x lamprophyllum and with a naturally bushy habit makes a good low hedge. With small foliage, it takes well to regular light pruning. Foliage is a good mid green, glossy and dense. 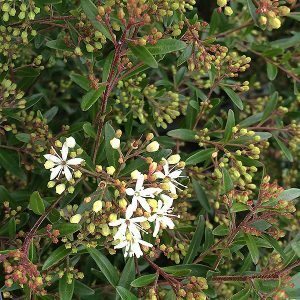 Flowering in winter to spring, the small starry white flowers will almost cover the bush. The foliage is aromatic when rubbed and the flowers attract bees and birds to the garden. One of the joys of ‘Green Screen’ is that it performs remarkably well in light to medium shade as well sun. Its natural growth habit means that it retains foliage down to ground level. With a naturally bushy habit and taking well to regular pruning, once established Leionema ‘Green Screen’ is remarkably low care. It will thrive and flower in a position where it receives very little sun in winter. You will need to deep water every few weeks during the first summer. If you mulch around the plant, it should little to no water after that. Used as a low to medium informal hedge or screening plant as well as a feature plant in a corner of the garden. Useful un the garden border as a background plant and excellent as a foundation plant in a native garden where it can add some structure. Very useful plant for smaller gardens. An excellent for dry shade. Height – To around 2 metres – easily pruned to .5 to 1 metre. Spread – To around 2 metres, can be pruned to around .7m to 1 m.
Flowers – Small white coloured flowers. Flowering time – Spring through to summer.